Anyway, whilst leafing through the interesting addons I could use I found Box2D which is a 2d physics engine which I thought might work well in a demo. 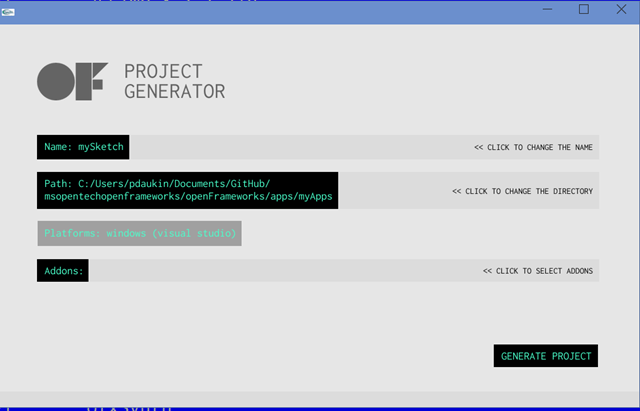 In the build of the oFx project generator that I am using (from the universal branch here https://github.com/MSOpenTech/openFrameworks) the addons feature doesn’t seem to work. To work around this I used a different fork of oFx from here https://github.com/liquidzym/openFrameworks/tree/VS2013 which has support for Visual Studio 2013 and I added the addon and then I copied the entries from the Visual Studio project files across into my Windows Store projects. Using that method I got Box2D into my app. From there I could define a Box2D world with physical properties and boundaries and I could introduce rigid bodies into the world. 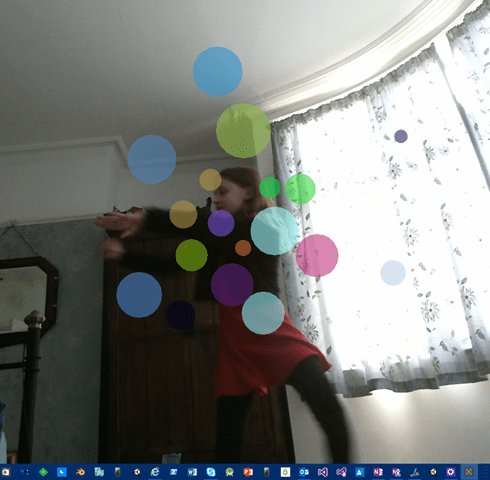 I chose to populate the world with differently-coloured circles, I set the boundaries to be the edges of the app and I used the Kinect body data to make my hands attraction points for the circles. Note the use of the Kinect SDK’s coordinate mapper to map the hand locations from absolute 3d positions to 2d points in my physics world. It is mildly amusing to make the circles chase you as you swing your hands around but not difficult to let your imagination run riot thinking about the possibilities here. My demo was put together with a few lines of code – that’s the power of OpenFrameworks and other similar frameworks – they include a host of creative elements without the need to reinvent everything.